The origins of Varzi Salame are to be found in the dawn of time. They are a tradition, a salame making technique, a gastronomic practice which was consolidated and perfected throughout centuries. 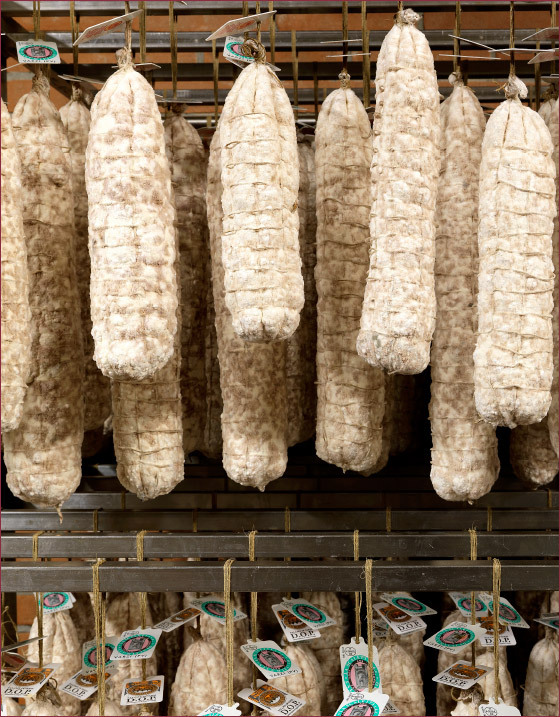 Today Salame di Varzi is produced by following the same recipes and techniques which were employed centuries ago. 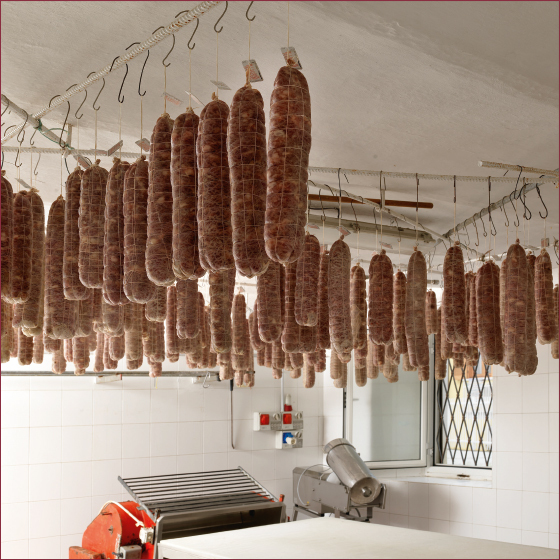 Though using more modern tools and machineries, it is safe to proudly say that production of the cured meat still follows traditional methods. Depending on the stage and place of its seasoning, the product can emanate more or less strongly spiced aromas, delicate hints of mold and bread crust fragrances, alternating hints of green wood, grass and Mimosa. Its taste is characteristically sweet and delicate, accompanied by a typically fragrant aroma. Its aftertaste is slightly bitterish, again depending on the stage of the salame’s seasoning. 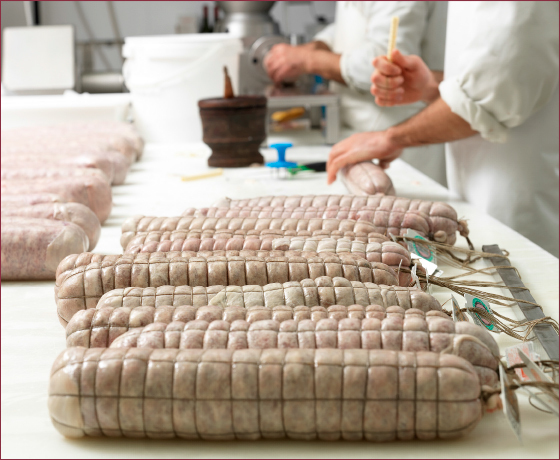 Salame di Varzi is listed in the Register of protected origin denominations and protected geographical labels, with EC Ruling n° 1107/96 of the Commission, dated 12/06/96, in compliance with EC Ruling n° 2081/92. Since 2005 Salame di Varzi D.O.P. is guaranteed by MIPAAF (Ministry for Farming, Food and Forestry Policies) by means of controls performed by the appointed certification institute. In compliance with art. 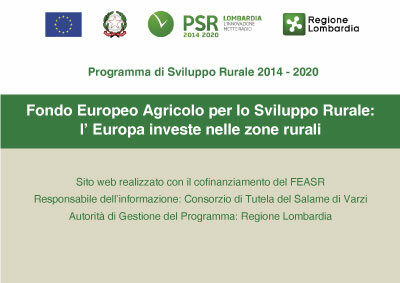 14, comma 15, of law n.526 dated 21/12/99, the Consorzio has been recognised as a “safeguarding” one by MIPAAF thus being appointed for its supervision through a decree dated 28/01/09. Human dietary habits have always been influenced by the need to preserve food and especially meat. In the past this was possible by means of different techniques: drying, smoking, seasoning and where the climate allowed it, freezing. It is believed that the production of Salame was introduced into the Staffora valley and surrounding areas by the Longobards, who moved into these lands in the late Middle Ages. As this theory is hard to prove with complete certainty, it is however safe to state that it was undoubtedly linked to monasteries and abbeys which existed across Lombard region from the XII century onwards. After the birth of the Benedictine order, work inside monasteries took on a fundamental role, so much so that they were crucial in the local economic and social recovery which took place after the so-called barbaric invasions. One of the many manual crafts which was practiced inside these monasteries was the production of cured foods. More concretely, to preserve their meat over a longer timespan, monks produced a type of Salame which preserved pig meat’s nutrients longer. Its qualities were subsequently refined through seasoning, thanks to which it gained an increasingly better, more intense taste. It is highly probable that the correct combination of the various ingredients which make Varzi salame so unique is to be owed to these monks: it’s a perfect balance between fat and lean parts, salt and spices so characteristic in the “salame dolce”-sweet salame of the Staffora valley. We inherited it after many trials and gradual taste tweaks, also direct consequences of experience and practice of these Middle age Benedictine monks in the field. DOP Varzi salame comes to you with a seal certifying its quality. This seal has accompanied it from the production laboratory to the end of its seasoning. CONSISTENCY:The mix should be compact and tender, soft to the touch, and lack empty spaces. APPEARANCE WHEN CUT: A lively red with perfectly white fat granules, absence of connective parts, lack of rancid areas or yellowish external crown/ring. AROMA: Depending on the stage of its seasoning, the product can emanate more or less strongly spiced perfumes, delicate hints of mold and bread crust fragrances, alternating fragrances of green wood, grass and Mimosa. These hint delicately to the cellar in which it was seasoned. There must be no hints of pig smell or any unpleasant odour connected to bad production or negligent conservation. TASTE: : In its fragrance, a characteristic sweet and delicate aroma. Its aftertaste is slightly bitterish, again depending on the stage of the salame’s seasoning. There should not be a strong hint of garlic.